We’ve all been very excited over the news that Mr. C’s cousin Frank is going to be a grandpa! Well, the baby was due on Valentine’s Day, but she decided to put in her appearance a few days early. I haven’t gone anywhere near mama or baby yet because I’m still fighting off the after shocks of the flu (sinus infection followed by bronchitis). Some things you just don’t want to share, am I right? …but I’ve been quietly stitching away in the background in anticipation of the special delivery. I had so much fun shopping for the fabric. I decided not to use my stash…I wanted something brand new. Don’t you just love these sweet vintage-inspired prints? They go so nicely with the pinwheels, which are themselves a vintage quilt block. In fact, according to one quilt historian, the pieced pinwheel block pattern hails back to 1795, following the invention of the cotton gin! I put prairie points between the inside & outside borders because babies just love little tags of cloth to explore and fiddle with..
At 35 x 42 inches, it’s perfect for tummy time. 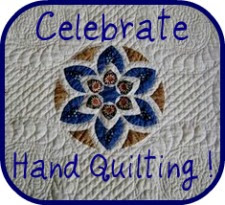 This entry was posted in Blog Categories, child, fabric, Gifts, Hand Quilting, Quilting, Quilts and tagged hand quilting, pinwheel baby quilt. Bookmark the permalink. Love the quilt, especially the prairie points. They add so much depth. Thanks for sharing. I’m impressed! It’s beautiful and it’s hand quilted – wow! I’m sorry your cold is lingering on so long! Darn sinus infections!! (pop you little yellow frog around for a few puppy laughs! LOL!!) Okay…I’ve saved this pinwheel pattern too and love your vintage prints. What they are and what did you use for the background? These are the exact kind of fabrics a friend of mine loves and I can never find them. Sending a virtual get well hug and smile!